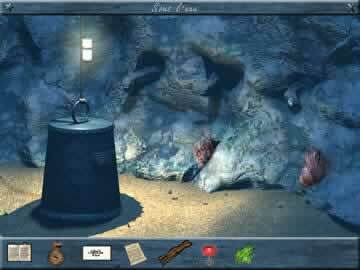 Eye of the Kraken Game - Download and Play Free Version! Figure Out Which Suspcious Passenger Has Stolen the Valuable Eye of the Kraken! Find the Thief Before It's Too Late! A chase is in progress and a disguised thief speeds down to the docks, jumping over crates, and boards a ship leaving his pursuers to shake their fists in the air. The next morning, Abdullah, an emissary to the Sultan, receives a message asking him to recover a stolen artifact that is believed to be aboard the vessel he is traveling on, the Glutomax. The Glutomax will take a week before arriving at Hyade Island. Until then, Abdullah will have to discover which of the suspicious passengers has stolen the Eye of the Kraken. He must work quickly though, because if the thief makes it to the Island, it will possible for him to awaken the Great Kraken and rule the world. 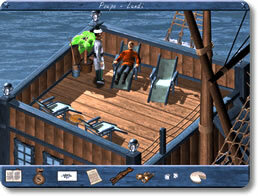 Eye of the Kraken plays like most other point-and-click adventures with you moving around different environments and interacting with other character through just the click of a mouse. Eye of the Kraken's interface is very well-designed and simple to use with inventory items appearing at the bottom of the screen and a cursor which turns red over hot-spots, opening a drop-down menu to allow interaction. The simple graphics give a unique charm to the game and the attention to detail in each of the passengers' cabins is very refreshing. Most of the puzzles which you'll face can be logically solved through inventory manipulation and interrogating the other zany passengers aboard the Glutomax. Each day is split into three time blocks and you'll have to complete certain tasks to progress, including some rather bizarre missions such as cockroach racing. Perhaps one of the most interesting aspects to Eye of the Kraken, and what differentiates it from other adventure games, is the hilarious cast of characters which you'll interact with. Abdullah encounters icons of literature like Odysseus and Count Dracula, historical figures such as Villon and Rasputin, and unusual new characters, including Olaf the Viking and Aboubakar, a powerful African marabout. With a blend of highbrow cultural references, slapstick, and numerous allusions to literary works, the humor in Eye of the Kraken is sure to find a fan with any age group. So if you like point-and-click adventures with plenty of hilarious moments, then download Eye of the Kraken and give it a try today! 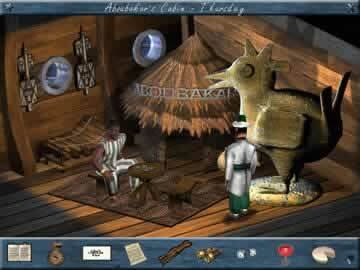 Watch the game intro and get a glimpse of the quirky point-and-click adventure that is Eye of the Kraken.